Mayer, Dr. Ludwig M., 1839-1878., Docent der Chirurgie in München. Leipzig: Verlag von F. C. W. Vogel, 1873. Dritter Band., pp. 35-106., ill.
Plates I-II., III., (collotypes), Plate IV. (lithograph). Photographed and printed by J.B. Obernetter, Munich. Surgical War Reports from the Years 1870/1871. Prognoses were grim for soldiers wounded in the Franco-Prussian war. Three quarters of the amputations administered by French doctors resulted in a fatal sepsus. By comparison, the mortality rate was 26.3% for surgical amputations performed by American doctors during the civil war. If the French were particularly unclean with their medical procedures, the Germans at least had the benefit of Lister's counsel for aseptic surgery beginning in 1868 and disseminated by a pamphlet that he wrote at the onset of the war. As a consequence of Lister's contributions and improvements made in the conveyance of the wounded, the Germans were able to effect a lower mortality rate than that achieved by their American colleagues. "Therefore I am, as I said, far off from underrating carbolic acid as antiseptic aid, neither do I go so far as to hold it up as the true panacea for all wound threatening incidents, it ought to be that the Lister procedure has a special advantage [Vorzüge], a method which can be passed on for its circumstantiality truly for individual injuries, but hardly for wounds such as those delivered by war in quantities. " To be fair to Mayer and his colleagues, the new Lister method was being tested on the fly in a theater of horrors. No antiseptic can purge a shattered limb that is riddled with necrotic shards of bone. Moreover, the German doctors were also chastened by the criticism leveled against the American civil war surgeons who were so quick with their reflex to amputate. Mayer directs much of his writing in this report to the question of when to conserve or sacrifice a limb and he summons the words of Billroth, Langenbeck, MacCormac and many other lights to provide a quite comprehensive disquisition on amputation. 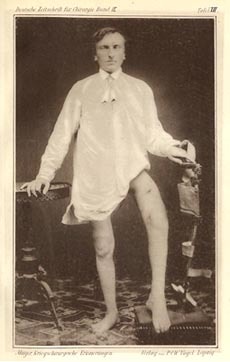 The photograph he provides shows the soldier August Keppler who died after "175 pain filled days" and who might have been saved, he argues, if the leg had been amputated. 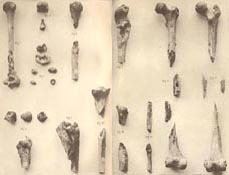 Mayer also presents a photographic table of sections which clearly shows the destructing of bones against bullets. Keppler's femur is specimen 6 and, interestingly, shows consolidation between two large broken sections of bone. Although there is no photographer's name on the plate, it is my belief that Albert produced the portrait of Keppler (Plate 3). An excellent historic comparison of two different collotype processes! 'Picturing the Landscape' by John Richardson. Photogenic Papers Edited by John Richardson [online content], Continuum: The Australian Journal of Media & Culture vol. 6 no 2 (1991).